At this year’s Epsom Derby Camelot will lead the field in the smallest field for more than a century in Saturday’s big race. Just nine runners line up in. Those over at www.freebetting.com note how Aiden O’Brien trains the race favourite Camelot and he will also run stablemate Astrology. The Irish trainer has however, released three of his runners from the race. Imperial Monarch, Father of Science and Tower Rock were all withdrawn on Thursday. Obrien has chosen to run Imperial Monach on Sunday instead of Saturday. Camelot was the winner in the 2000 Guineas at Newmarket last week after a late surge is now looking to make history in this classic event as it is believed that no father-son trainer and jockey have ever won the Derby. 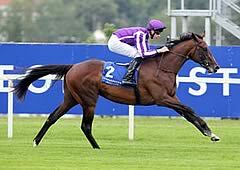 O'Brien’s son Joseph will partner with Camelot. 4/6 are the odds given on the race favourite. Bonfire is looking like being the main challenger to Camelot. After winning the Dante Stakes earlier in the month, Bonfire looks to be in great shape and trainer Andrew Balding will be looking for his first success in the mile-and-a-half race. Bonfire is being offered at 11/2 which looks to be a good bet as the second favourite looks to have all of the attributes for success. Hayley Turner will become the second women to compete in the famous event when she partner big outsider Cavaleiro. She will be hopeful of a better finish than Alex Greaves who finished in last position back in 1996. It is the first time since 1907 that only nine runners have competed in the race. A big crowd of 150 000 is expected to flood through Epsom Downs on the big day and the going at the Surrey course is looking to at being good, good to firm in places with some sections of the course being watered. This year will be the first time in 20 years that Frankie Dettori will not be competing in race when fit. He won the Derby back in 2007 on Authorized. However, the 41-year-old has dismissed claims that he may be retiring from the sport, stating that he feels he still has plenty to give to racing. Dettori will race at Haydock on Saturday and when asked about calling it a day he said: "I've got at least five more years in me. I'm only 41 and would challenge any jockey to a one-on-one." He has produced 13 winners in 92 rides this campaign.